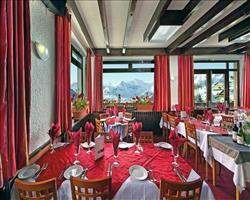 Situated in the Quartier des Bergers on the East side of Alpe d’Huez. The Alpauris chair is just 320 metres (approx.) and for beginners the main ski school meeting point is just 300 metres (approx.) from the chalet. Conveniently, to make your ski holiday even easier Les Bergers’ small selection of shops and bars are only a short walk away. Chalet Friandise was newly built last season. It has proved to be a real crowd pleaser and that is not simply due to the heated boot dryers. Constructed using traditional timber and stone, it blends perfectly with the stunning alpine backdrop. The interior facilities juxtapose the subtle exterior design, featuring four crisply appointed modern bedrooms each with a spacious en suite bathroom and a large open-plan living area with floor to ceiling windows which run almost the entire length of the room. An outdoor terrace provides mountain views and opportunities to enjoy stunning alpenglow sunsets as well as soothing away the aches in your own private hot tub after a hard day’s skiing. And if this is not enough the chalet also boasts a sauna for you to enjoy! As rooms 1 and 4 can be configured either as twin or king-sized beds, we will make them up as twins unless we are advised otherwise. We update Chalet Friandise's details often, but facilities do change. e.g. some extras listed by the supplier as "free" or included might only be for the first time you use them, or for one time per party, then charged for further use. If any specific feature is essential to your holiday, make sure you ask us to confirm the details of it before you book your holiday. This all inclusive holiday to Chalet Friandise in Alpe d'Huez, France departs Saturday 4th January 2020, for a 7 night stay on a "catered chalet" board basis. A local tourist tax (Taxe de Sejour or Kurtaxe) is levied by many councils in European ski resorts. It varies by standard and type of accommodation and is age dependent, so not everyone is charged. It's not included in the basic price of your holiday and is usually paid locally. For reference, the average charged in winter 15/16 was between 50p and £2 per person, per night. Alpe d'Huez lift pass price last reported as €225 (adult 6 day). 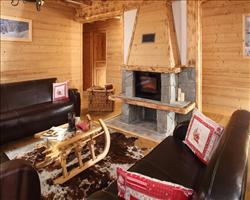 Ask for a quote when booking Chalet Friandise. 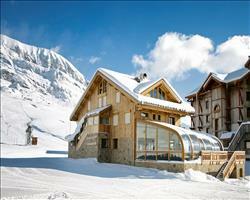 Chalet Hotel Les ... Alpe d'Huez France, Gatwick to Chambéry 4th January. 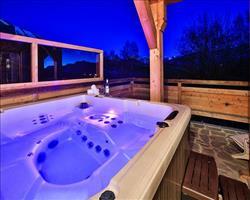 Chalet Le Lac Bla... Alpe d'Huez France, Gatwick to Grenoble 4th January. 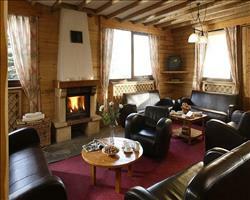 Chalet Naomi Alpe d'Huez France, Gatwick to Grenoble 4th January. 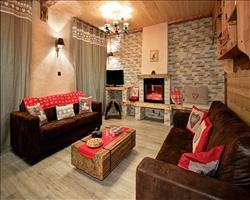 Chalet Martine Alpe d'Huez France, Gatwick to Grenoble 4th January. Chalet Sarenne Alpe d'Huez France, Gatwick to Grenoble 4th January. "Modern yet old school and high quality"
A new build, the hard timber interior is balanced out by modern accompaniments, including a hot tub (check its running on your dates before booking). 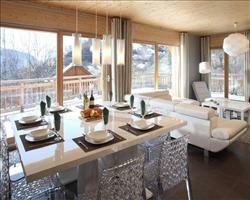 An open plan living/dining room make it spacious but cosy, perfect for lounging about after a good day on the piste. The short 350yard walk from the piste, and 280yards from the village gives a sense of seclusion, without being too far from the action.